You can also restrict the application of the discount depending on the customer groups. Go to J2store -> Sales -> Promotions and enable app. Open the Plugin Bulk Discount. Text entered here will be displayed as promotion display text. Set this to Yes to remove the discount when customer used the coupon. Set this YES display the promotion message in the cart if any bulk discount not applied. Cart Qty : This will apply the discount globally i.e. based on the cart quantity. This will work only when you enable the bulk discount globally in Global discount settings. Line item Qty : This will apply the discount based on the product. 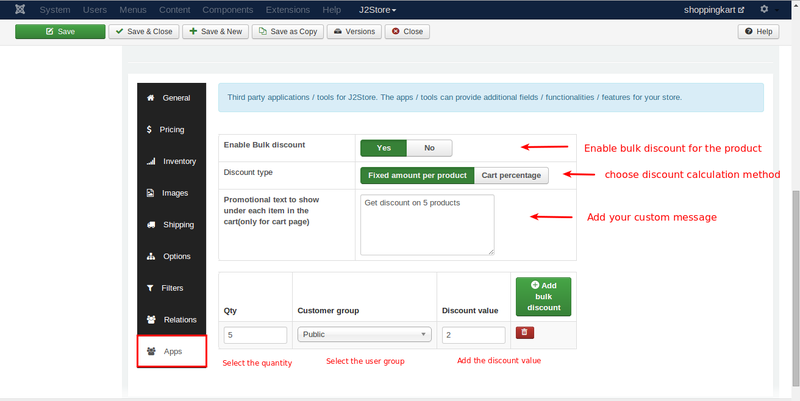 You can set discount to the product individually in the apps tab on j2store cart. Once you enabled Line item Quantity, the discount will be applied to the individual products.Refer the below image for setting discount for the product individually. Per quantity Discount: The discount is based on the product. Total Discount: Discount is the based on the total purchase amount of a particular order irrespective of the quantity. Display the discount information in any one of the three options(Products view only, Category view only, Both product and category view). Set this YES will enable the global discount function. Fixed amount per product : Enable this will calculate the discount on fixed price. Cart Percentage : Enable this will calculate the discount based on percentage. Custom text entered here will be displayed under each product in the cart. Here you can set the custom class, if you set the quantity for one and above. This app will allow you to set discount by category wise. Go to Content > Categories > Open the category(to which you want to set bulk discount) > Bulk Discount tab. Set this YES to enable the bulk discount for the category. Line item Qty : This will apply the discount based on the product. 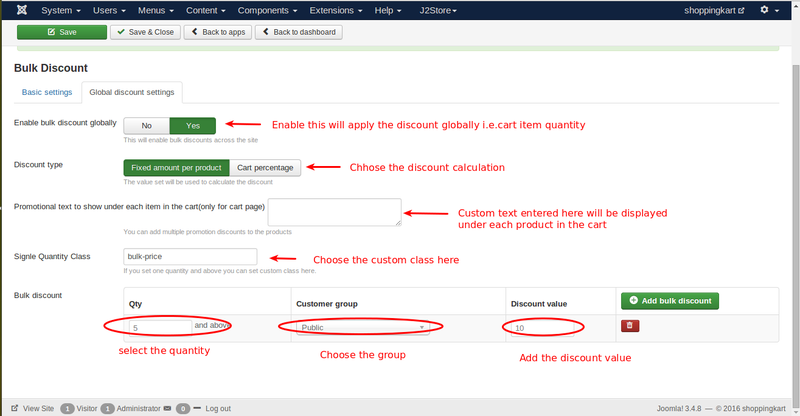 You can set discount to the product individually in the apps tab on j2store cart. Once you enabled Line item Quantity, the discount will be applied to the individual products.